We must know that the only way we can keep healthy is through our Indian Classical Music. H. H. Adishakti Shri Mataji Nirmaladevi 27-1-1986. Nirmalanand-Acharya Dr. Sadanand Ganpati Mankar JP. Nirmalanand-Acharya Dr. Sadanand Ganpati Mankar JP.ICMRAA. Indian Classical Music Research Academy Australia. 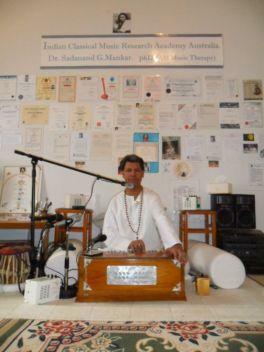 The Indian Classical Music Research Acadmey Australia-ICMRAA was founded by Acharya Dr. Sadanand G. Mankar JP. The ICMRAA was started in 1999 and offically registered on the 15th of June 2006 in Australia. The ICMRAA respects and follow the teachings of Guru H. H. Adishakti Shri Mataji Nirmaladevi. Classes are offered for North Indian Classical (Hindustani) Raga Music from Beginners/Diploma/Master to Ph.D. level and also Chakra Raga meditative music, how to awaken/sooth Raga/chakra deities, how to balance body chakras with Indian Ragas, Dhrupad/ Dhamar(Dager style), Khayal(Jaipur/Agra/Kirana gharana), Bhajan, Body Chakra cleansing/Balancing, Sahaj Music, Yoga Sadhana, Nadopasana, Omkar Sadhana, Sanskrit chanting, Bija Mantras, Intro Music Therapy etc. World peace begins with inner peace. The origins of Indian classical music can be found in the Vedas, which are the oldest scriptures in the Hindu tradition. The Samaveda, one of the four Vedas, describes music at length. The Samaveda was derived from the Rigveda so that its hymns could be sung as Samagana; this style evolved into jatis and eventually into ragas. Indian classical music is both elaborate and expressive. Like Western classical music, it divides the octave into 12 semitones of which the 7 basic notes are, in ascending tonal order, Sa Re Ga Ma Pa Dha Ni. Hindustani music, is similar to Western music's Do Re Mi Fa Sol La Ti Do. However, Indian music is dependant on 22 shrutis, which are microtones within that octave. These microtones are not easily discernable to the Western trained ear which is used to the sound of tempered instruments. 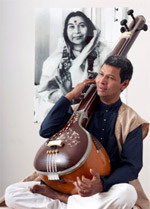 Indian classical music places great emphasis on improvisation. It is not possible to write precise notation systems for ragas because Hindustani music is in between the notes. It has to be received from the mouth of the guru to understand the application of each sound. This ancient heavenly music is spiritual. It evolved as an adjunct to meditation because it pleases the deities. After Self-realisation, H.H. Shri. Mataji Nirmaladevi's Meditation practised in conjunction with this music(Indian Classical Raga) enables a deeper meditation. The correct application of the particular shrutis (notes) in each raga matches the frequencies of the chakras. This is the basis of Raga chikitsa, the ancient science of healing through music. Australia | Copyright 2014 Acharya Dr. Sadanand Ganpati Mankar JP All Rights Reserved. For classes in Khayal, Dhrupad and Dhamar Hindustani-north Indian classical Raga music contact Dr Sadanand G. Mankar on indianmusic@icmraa.com or 61- 407561662.